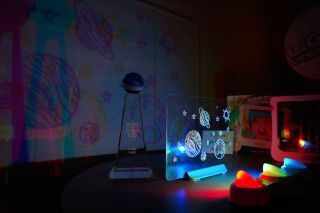 Crayola's Shadow Fx Color Projector won the "Cosmic Space" Space Age Award at the 2014 Toy Fair. Space.com is now inviting submissions for the 2015 Space Age Awards at Toy Fair. NEW YORK — Space.com, the premier destination for innovation, technology, entertainment, astronomy and space news, is now accepting submissions for the Space.com Space Age Awards at Toy Fair 2015 in February. Only products that are announced or first shown at the Toy Fair will be considered. Embargoes on products will be honored. If you have any questions, please contact Tariq directly at 212-703-5859 or tmalik@space.com. Space.com, a Purch company, launched in 1999 and is the world's No. 1 source for news of innovation, astronomy, skywatching, space exploration, commercial spaceflight and related technologies and entertainment. Our team of experienced reporters, editors and video producers explore the latest futuristic ideas, discoveries, missions, and trends — interviewing expert sources and offering up deep and broad analysis of the findings and issues that are fundamental to or understanding of the universe and our place in it. Space.com articles are regularly featured on the web sites of our media partners: MSNBC.com, Yahoo!, the Christian Science Monitor and others. Purch is a portfolio of digital brands and services that helps make complex buying decisions easy for 100 million consumers monthly. Its respected sites such as Top Ten Reviews, Tom's Guide, Tom's Hardware, and Live Sciencenatively integrate commerce and content in more than 1000 product categories so consumers can make better choices before, during, and after an important purchase. The company helps marketers achieve their branding and performance objectives in a high-quality, brand-safe context. Its sites connect in-market shoppers with more than 7,000 marketers and sellers, driving industry-leading conversion rates and $1 billion in commerce transactions annually. Purch is a high-growth, privately held company with more than 350 employees and offices across the U.S. and Europe. For more information on Purch, visit www.purch.com or follow the company on Twitter, LinkedIn, and Facebook. Follow us @Spacedotcom, Facebook and Google+.